Tools for peaceful, nonviolent lives including community building, affirmation, communication, cooperation and transforming power. This workshop is the prerequisite for all further events/workshops. Tools for trauma recovery, safety, memory reprocessing and reconnection. Note: Empowerment Workshop is a recommended prerequisite. Contact Nadine Hoover, ConscienceStudio@gmail.com for details. Tools for rooting out patterns of prejudice and privilege from our daily lives and interrupting intergenerational cycles of oppression. Tools for organizing and decision making based on discerning a consensus of conscience. Participants: Everyone welcome, especially citizen leaders working to create nonviolent, peaceful families, communities and cultures. Diversity of age, gender, ethnicity, class, language, belief, political view, talent and occupation strengthens these workshops. Refunds: We refund the full amount if cancelled 30 days prior to the training. We refund 100% of food and lodging and 50% of registration if cancelled 29-10 days prior to the training. We refund for emergencies only if nine days or less prior to the training. We refund 100% of food and lodging and 90% of registration at any time for reasons of family death, illness, or other extraordinary circumstance. In case of emergency, you may call in or email a cancellation. Work study and/or scholarships available for any workshop. We invite you to host a training! Click on the Host a Workshop tab to learn how. Conscience occurs in relationships, best practiced in intact communities of people who live, work, worship or gather socially together on a regular basis. 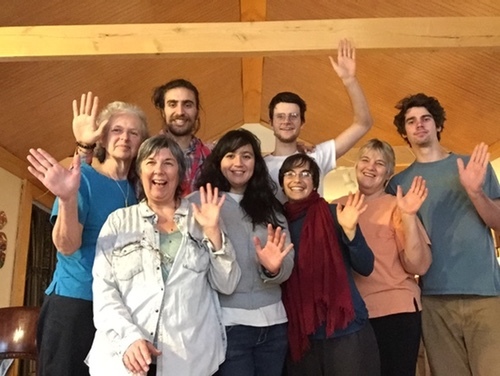 Empowerment Workshop: to build community and to practice skills necessary for nonviolent use of power; a foundation for all other workshops (AVP equivalent training). Resiliency Workshop: An experiential workshop to practice personal and cooperative tools to discharge and reprocess emotional pain or distress in order to face and heal from challenging experiences. Developmental Play: An experiential workshop to play with materials using nonviolent directions in ways that build intergenerational connections and reconstitute developmental capacities eroded by exposure to stress and violence. Discernment: An experiential workshop to learn to listen to and act on conscience, accurately perceive the nature of things, base one's decision making on discernment and exchange feedback. Conscience: A writing workshop to create statements of conscience, consider implications for daily life and practice speaking publicly from your conscience. Each workshop may be held as an introductory workshop to learn that area of practice or as an advanced workshop to explore extensions in the area of practice. All the workshops use experiential activities to develop tools and practices to use in daily life. We each work on our own personal material to explore and develop personal change. Conscience Studio: An open studio with facilitated time to share, exchange feedback and document insight as well as studio time to create outward forms to reflect inward knowledge. Classes: Six-week Co-counseling, Developmental Play or Discernment classes may be arranged for groups of six or more. Goal or intention: It helps you and us if your group states a goal or intention for requesting training, with both immediate and long-term consideration. Participants: Describe the participants. Typically six to 24 participants, although we have custom designed approaches for larger groups. The more diversity of age, background, class, religion, politics and so forth, the better. Facilities: We hold workshops in homes, retreat centers, community centers, schools, anywhere a group feels comfortable. We prefer sites with a sense of nature, wholesome foods and water, places for physical activity on the breaks, a large room we can tape papers to the wall and areas for small groups to use. Prerequisites: Empowerment Workshop or equivalent AVP Basic Workshop (avpinternational.org or avpusa.org) recommended before attending other workshops. We list workshops in the order we commonly offer them, but we customize for the group as well. Organizers sometimes plan three consecutive days without evening sessions, or start "after school" at 3:30 or 4:00p on the first day. Costs: The host covers travel and expenses plus $1,800 for a recognized facilitator. Apprentices pay their own expenses, but no registration fees, and 10% of net proceeds go to Conscience Studio. Simplicity: We encourage low-cost arrangements, home hospitality, cooperative cooking of wholesome foods and cooperative cleaning before, during and after the workshops. Upon request, we can provide a standard shopping list for food, easily managed by the group during the course of the workshop, to reduce costs. Facilitators: We facilitate with teams of three or more, including at least one recognized facilitator along with apprentices who completed the workshop as a participant and routinely practice on their own. You choose to fund one or two recognized facilitator(s) and either we or you may organize apprentices. Becoming a facilitator: You may organize a one- to three-day facilitators' training on any topic or go directly to apprenticing on a team. When you feel comfortable leading all the activities and hosting your own workshop, you may approach a recognized facilitator and ask Conscience Studio to recognize you as a facilitator of that workshop.